Today the air was crisp and the wind was blowing the leaves all over the neighborhood - Fall has arrived. 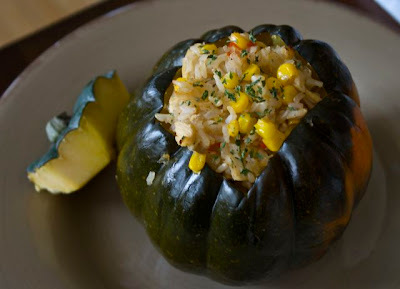 I was inspired by today's weather to try out a new recipe for Stuffed Winter Squash. I got the recipe from a West Texas cookbook called Barbecue, Biscuits, & Beans. It's a fabulous little collection of real deal cowboy recipes. They even tell you how to make sourdough over a campfire! The winter squash looked so yummy in the photos I had to give it a try. As a bonus, it was on sale at the grocery store last week for $ .39/lb. I love seasonal veggie specials! Not only did it taste fabulous, it looked fabulous. I am a sucker for food that looks pretty and tastes good. Of course, I changed the recipe a bit. (Shhh...don't tell the cowboy cooks.) After all, I am a mostly vegetarian dieter now and I'm trying to watch the pregnancy weight. Both of those factors necessitated me omitting the entire stick of butter and adding some whole grain brown rice to balance out the chicken. And yes, I'm aware that the cowboys would probably not appreciate that brown rice bit. But look at it this way, I am totally giving them credit for a tasty and beautiful Fall recipe! Cut top off squash and remove seeds. Place cut side down in 1/2 inch of water in a baking pan. Bake 45 to 50 minutes until squash is tender. While squash is baking, prepare stuffing. STUFFING: Cook chicken breasts in vegetable broth + salted water to cover until done, about 20 minutes, then dice. Save the vegetable broth/water mixture from cooking the chicken. Melt margarine in large skillet and add onions. Saute about 5 minutes, then add wine and veg broth mixture if you need more liquid. (This method of cooking saves you a ton of fat instead of cooking the onions in the butter!) Add corn to onions and cook for about 8 minutes. Again, if you need more liquid - you don't want it to boil dry - add the veg broth mixture. And, hey, even add a little more wine if you have it! Not more than a 1/2 cup, though. Add bell pepper and chicken and cook for about 3 minutes over low heat. Remove from heat and add the rice to the mixture. Salt and pepper to taste. Dry inside of squash with a paper towel. Add stuffing and bake, stuffing side up, in same pan without water for 10 minutes. Serve hot. Add a salad and you have a whole meal in less than an hour! * If you'd like to try the full fat method, omit the veg broth, wine, and margarine. Use a whole stick of butter instead. The cowboys also recommended you add some diced jalapeno to the onion mixture, but I couldn't bring myself to add it for fear that my 14-month-old wouldn't eat it! Mmm! That looks beautiful and sounds oh, so yummy! I love "Fall cooking" and have to put this one on my list!